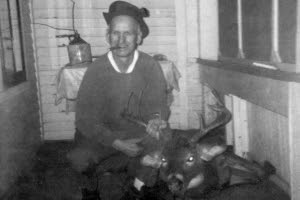 The family ate very well one winter back in the early 1960’s after my Dad shot this (almost) 200 pound whitetail buck between Milo and Bangor, Maine. He and 3 other men from the Milo area carpooled daily one hour each way to work at the Bangor and Aroostook railroad shops near Bangor. The trip was nearly all woods the entire distance, and they would often spot whitetail deer. During deer hunting season the group carried a 30-06 rifle and rotated turns. Success depended on luck because each man had just one shot for every 4 deer. My Dad was fortunate to be riding shotgun and dropped this buck from over 1000 feet away. Later on when it was taken to the official weighing station, they found out he missed joining the prestigious 200 Pound Buck Club by half a pound. It was a mild disappointment. For parents raising 8 kids, the bonus meat came in handy. The butcher from the IGA in Milo was hired to cut and package the meat wrapped in paper which was put up in a standing freezer. There were roasts, steaks, ribs, and lotsa hamburgers that lasted most of the winter. I still remember the flavor of the steaks as if it was yesterday, yet I have not eaten venison in over 30 years. I’m overdue.